As many of you will be aware, changes were made to the OET exam materials in September of last year. The updated model of the OET exam is referred to as OET 2.0. 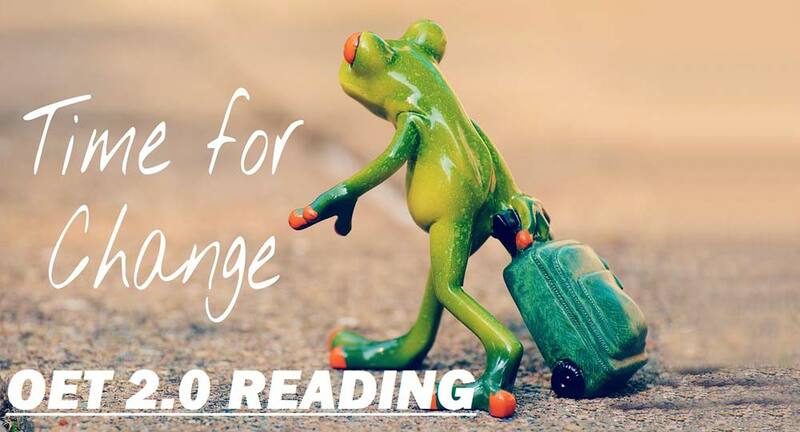 The reading section of the test saw the majority of the changes as the structure of the test has been changed with some new capabilities being tested in a different format. 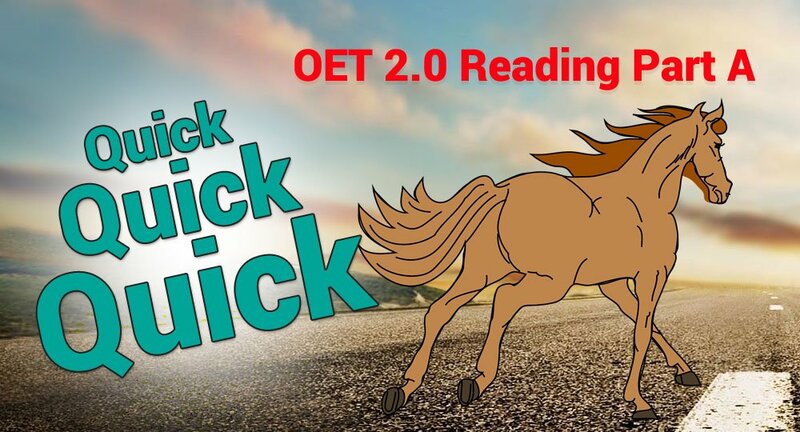 This article will give you all the information you will need to understand the current OET 2.0 reading test and some helpful tips and tricks about how to approach it. The OET reading subtest aims to assess your ability to understand and respond to text and questions based upon various medical workplace scenarios and healthcare topics. It now comprises three sections: Part A, B and C. Each section of the test is carefully designed to assess different capabilities and the materials used are suitable for any medical professional taking the exam. Remember, you are not being tested on your medical knowledge as such, but your English comprehension in a medical capacity. Part A of the reading subtest uses four texts. The texts are fairly short and are based upon work-place scenarios rather than academic or current medical issues. You will be required to answer 20 short questions of various formats in 15 minutes. The questions will increase in their level of difficulty from question 1 to 20. Rather than reading the tests first then tackling the questions, it is advisable to read the texts as you look at the first set of questions. The first set of questions are simply statements for which you will need to decide which text they go with and then match them to the correct one. As you read the texts for the first time, look at this set of questions and fill in the answers as you go along. In this way, you are saving time and preparing yourself for the next set of questions by familiarising yourself with the four texts. The next set of questions are also of a simple format. The skill being assessed is basic information retrieval from the text. No analysis, inference or deep understanding is required, just the ability to find the information that each question is referring to. The questions are sentences with gaps for you to fill in the missing information. Having spent some time scanning the texts while approaching the last set of questions, it should not be too difficult to find the missing words and copy them into the gaps. As you can see, part A is simply based on finding key information with a focus on speed. You will not need to spend a long time reading each text, rather skim and scan them to find the key points that you need to complete the questions. If you are stuck on a question, don’t spend a long time deliberating; move on, keeping a good pace and go back to the question at the end of the section if you have time. 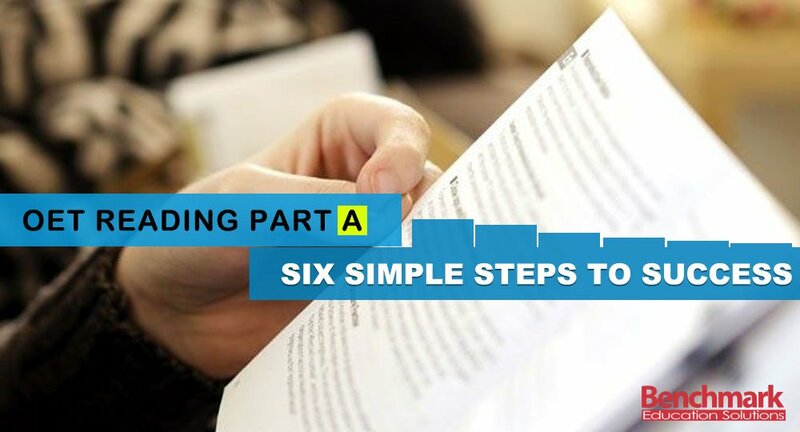 Part B of the reading subtest comprises six texts. The texts are fairly short and are work-place based but rather than scenarios, they are based on documents that you would need to understand in a medical work-place setting such as policies, regulations and procedures that need to be understood and followed. Each text has one multiple choice question with three options to choose from. You will have 45 minutes to complete part B and C together. How long you spend on each may depend on your self-awareness after completing practice tests about how long each takes you and whether you find one section easier or are able to complete one quicker than the other. In general, though, try not to get too bogged down in spending too much time reading these texts and don’t get frustrated if there are some gaps in your comprehension. Unlike part A, you are not being assessed on your ability to find specific information. Here, you are being tested on your general understanding of each text so really, you need to get the gist of the text, understanding what kind of document it is, what it is used for and what information it is trying to get across. Remember, the questions will likely use different words than you will find in the texts; you are being tested on your ability to ascertain general meaning rather than finding certain words and phrases. The texts in part C are longer and are extracts from informative articles or papers about issues related to the healthcare field. As we mentioned earlier, they are accessible to all health-care professionals, including nurses, and it is your comprehension rather than your medical knowledge that is being tested so don’t worry too much about the content being too difficult or related to an area you are unfamiliar with. There are two texts in this section with 8 multiple-choice questions to go with each text. There are four options for each multiple-choice question. The majority of the questions (six of each set of 8), are testing your comprehension of the viewpoint and impressions given in the text or the conclusions drawn; basically, what the writer is putting forward or the points that he/she is trying to get across to the reader. This requires a deeper understanding of the meaning of the text, using inference to ascertain what the author is trying to get across. This does not mean you have to understand everything in the text, and you should still use skimming and scanning skills when reading to save time. The other two questions for each text ask you to give a definition for the meaning of a word or phrase. Even if you do not know the exact meaning of the given word or phrase, you can work it out using the context around it and from your general understanding of the part of the text that it is taken from. In fact, it is essential that you explain the meaning of the word in its context in the text rather than looking at it as an isolated word or phrase. 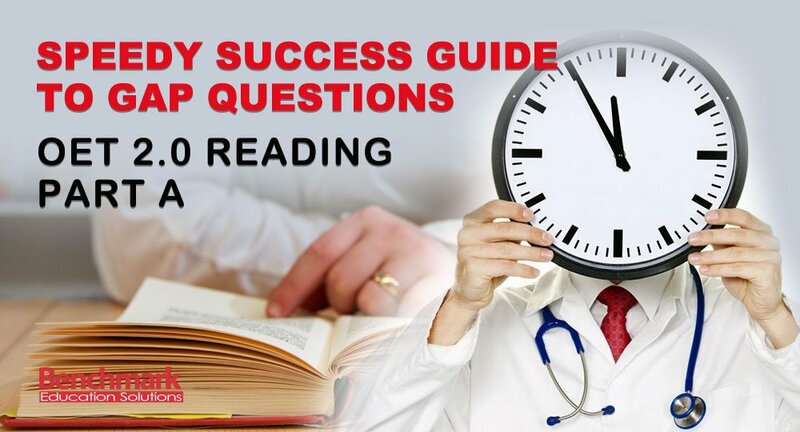 After reading this article, you should have a good idea of what is expected from you from the OET 2.0 reading test and some helpful hints about how to approach it. The next step is to get practising. We have some great deals on practice OET 2.0 reading samples available on our website to get you started. Complete OET 2.0 Reading Part A FAST with Our Amazing 4-Step Method! Reading format is the same for all occupations. My concern is how can I make sure that the difficulty level of your reading test is the same as real oet exam? Because there are many courses offer oet materials, but 1 or 2 are worthy to buy . My exam would be on 2/ Feb. and this is my second try , I failed last time in reading subtest and want to boost my preparation for the exam with more real oet reading materials. I know that you mentioned in your website that your reading materials are really same as the real oet exam , but I want to ask since I don’t have time or even money to lose , I paid a lot on oet exam .l know that your are really recommended in the writing correction, and most of the candidates rely on you in this sub test . But regarding reading materials, I asked and didn’t get any answer or recommendation. Most of the candidates are recommending swoosh or E2 language course since, these 2 are official oet providers. If you are willing to trust us with your writings, then you can trust us with reading as well. We wouldn’t offer something which is not worth buying. Nevertheless, decide accordingly – it’s your time and money!